Just like the previous instances, the emulator requires Hyper-V. This requires you to have hardware virtualization enabled in your BIOS. Consult the manual of your PC or motherboard on how to do that. If you don't know what I am talking about, for heavens sake stop here and don't attempt this yourself. I myself found it pretty scary already. If you make mistakes in your BIOS settings, your whole PC may become unusable. You have been warned. The easiest way to start is from Visual Studio. If you have installed the whole package, you will get this deployment target. You can choose whether you want debug or release - the latter is faster. Just click and the emulator starts up. Be aware this a heavy beast. It might take some time to start, it might also drag down the performance of your PC down somewhat. 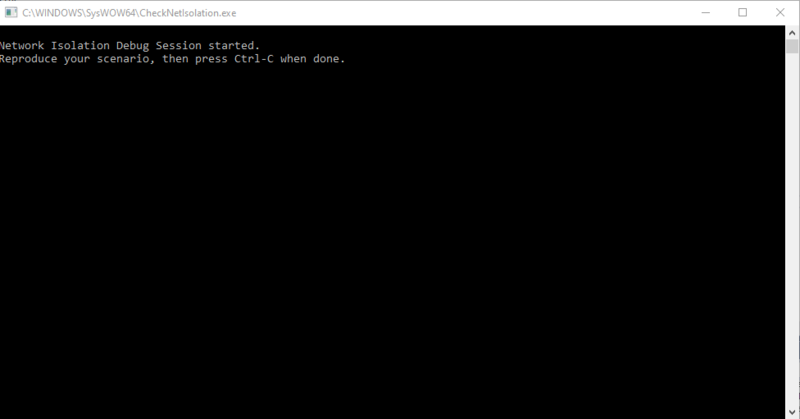 Accept the elevation prompt, and then most likely Visual Studio will thrown an error as it tries to deploy as soon as the emulator has started, but it's far from ready to accept deployment of apps - the HoloLens OS is still booting. After a while you will hear the (for HoloLens users familiar) "whooooooomp" sound indicating the OS shell is starting. If you have followed the Mixed Reality development in the 19H1 Insider's preview, you will clearly recognize that the Mixed Reality crew are aligning HoloLens 2 with the work that has been done for immersive WMR headsets. 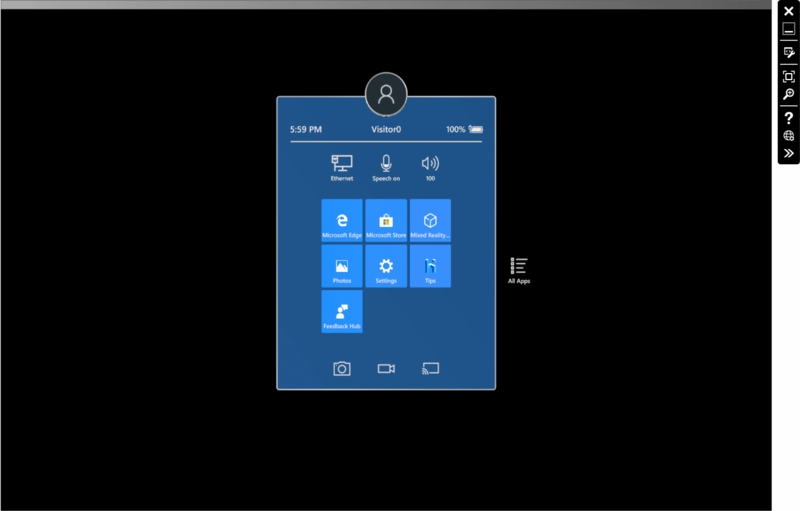 The download page gives some basic information about how you can use keystrokes, mouse or an XBox Controller to move your viewpoint around and do stuff like air tap and bloom. This page gives some more information, but it indicates it this is still for HoloLens 1 emulator. However, it looks like most of the keys are in there already. 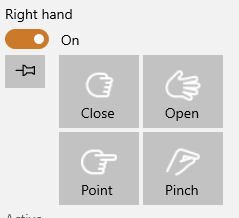 The most important one (initially) is the Escape key, which - just like in the HoloLens 1 emulator - will reset your viewpoint and your hand positions. And believe me, you are going to need them. This is more or less unchanged. You move around using the left stick, you turn around using the right stick. Rotating sideways van moving up/down is done using the D-pad. Selecting still happens using the triggers. To move the left hand, press the left bumper, and still use the left stick. Hands are visualized as show on the right. The little circle visualizes the location of the index finger, the line it a projection form the hand forward, to a location you might activate from afar - like ye olde airtap, although I am not quite sure of the actual gesture in real life. With the right stick, you control the hand's rotation. You can also see the buttons "Eyes". If you click that, I presume you can simulate eye tracking. But if you do that, the only thing I can see is that you can't move your position anymore.So I am probably missing something here. I have done more things, like actually deploying an app (the demo shown by Julia Schwarz, the technical lead for the new input model who so amazingly demoed the HoloLens 2 at MWC) but that's for another time. This really wets my appetite for the real device, but for the mean time, we have this, and need to be patient ;) No code this time, sorry, but there is nothing to code. Just download the emulator and share your thoughts. My relation with Unity is a complex one. I adore the development environment. It allows me to weave magic and create awesome HoloLens and Windows Mixed Reality apps with it with an ease that defies imagination for someone who never tried it. I also have cursed them to the seventh ring of hell for the way the move (too) fast and break things. Some time ago Unity announced they would do away with the .NET backend. 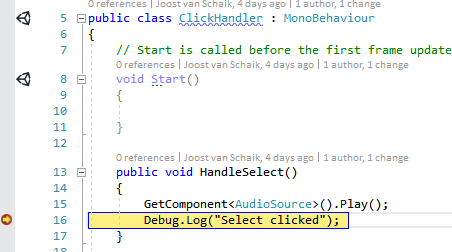 This does not mean you can't develop in C# anymore - you still do, but debugging becomes quite a bit more complicated. You can find how you can do it in various articles, forum posts, etc. They all have part of the story but not everything. I hope this fills the gap and shows the whole road to IL2CPP debugging in an easy to find article. Typically, when you build an app for Mixed Reality, you have a solution with C# code that you use while working inside the Unity Editor. You use this for typing code and trying things out. I tend to call this "the Unity solution" or "the editor solution". It is not a runnable or deployable app, but you can attach the Visual Studio debugger to the Unity editor by pressing Start in Visual Studio, and the the play button in Unity. Breakpoints will be hit, you can set watches, all of it. Very neat. When you are done or want to test with a device, you build the app. This generates another solution (I call that the deployment solution) that actually is an UWP app. You can deploy that to a HoloLens or to your PC with Mixed Reality headset attached. This is essentially the same code but in a different solution. The nice part of that is that if you compile it for debug, you can also put in breakpoints and analyze code on a running device. Bonus: if you change just some code you don't have to rebuild the deployment solution over and over again to do another test on the device. Unity, in their wisdom, have decided the deployment solutions in C# are too slow, they have deprecated the .NET 'backend', and so in stead of generating a C# UWP solution, they generate a C++ UWP solution. If you build, your C# code will be rewritten in C++, you will need to compile that C++ and deploy the resulting app to your device. Compilation takes a whole lot longer, if you change as much as a comma you need to build the whole deployment solution again, and the actual running code (C++) no longer resembles any code you have written yourself. And when they released this, you could also forget about debugging your C# code in a running app. Unity did not only move the cheese, they actually blew up part of the whole cheese storehouse. With Unity 2018.2.x - they've basically sent over some carpenters to cover up the hole with plywood at plaster. And now you can sort-of debug your C# code again. But it's a complicated and rather cumbersome process. I installed all of Desktop and UWP C++ development bits, probably a bit over the top. At one point I got complaints about the "VC++ 2015 (140) toolset" missing while compiling so I added that too. This is apparently something the Unity toolchain needs. Maybe this can be more efficient, needing less of this stuff, but this works on my machine. I really don't know anything about C++ development. I tried somewhere in the mid 90s and failed miserably. I did uncheck the Unity Editor option, as I used Unity 2018.3.6f1 in stead of the one Visual Studio tries to install. 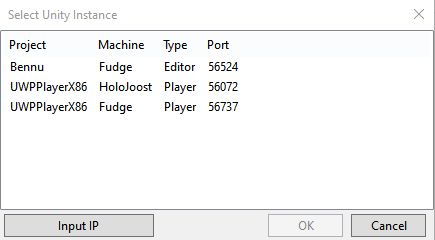 I tend to manage my Unity installs via the Unity Hub. I am not entirely sure if the "Copy References" is really necessary but I have added it anyway. The warning about missing components is another nice Unity touch - apparently something is missing, but they don't tell you what. My app is building, so I suppose it's not that important for my setup. I just added all network related stuff for good measure. The advantage of doing it here is that it will be added back even if you need to rebuild the deployment solution from scratch. The drawback is that you might forget to remove capabilities you don't need and you will end up with an app asking for a lot of capabilities it doesn't use. For you to decide what works best. In case Unity or the MRTK2 does not do this for you automatically, you can find this setting by pressing the Player Settings button as well. 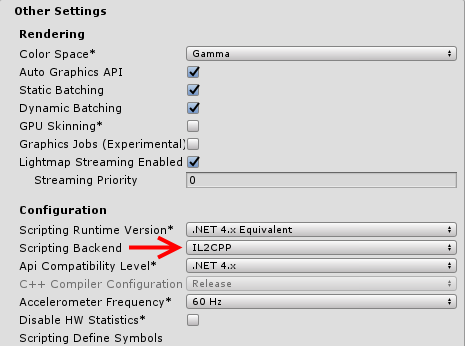 In "Other settings" you can find the "Scripting Backend". Set this to IL2CPP. 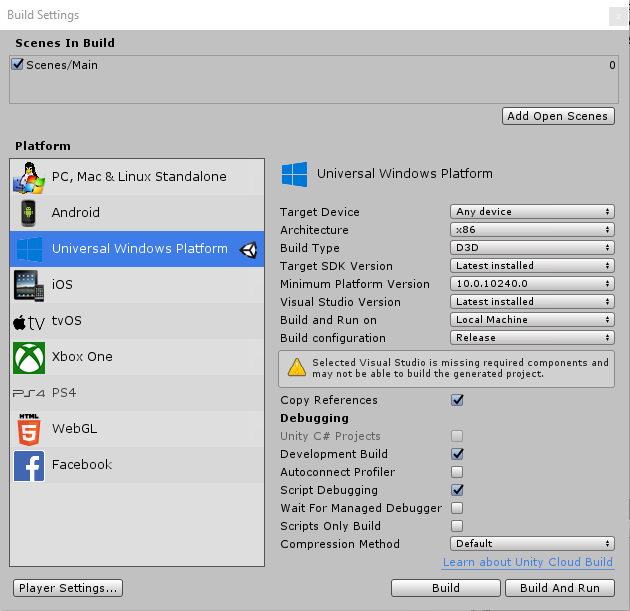 Building and deploying the UWP C++ app. 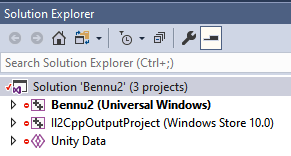 Now maybe this is obvious for C++ developers but make sure the app that is labeled "Universal Windows" is the startup project. I was initially thrown off kilter by the "Windows Store 10.0" link and assumed that was the startup project. Go back to your Unity C# ('editor' ) solution. Set breakpoints as desired. And now comes the part that really confused me for quite some time. I am used to debug targets showing up here. But they never do. So don't go there. This is only useful when you are debugging inside the Unity Editor. 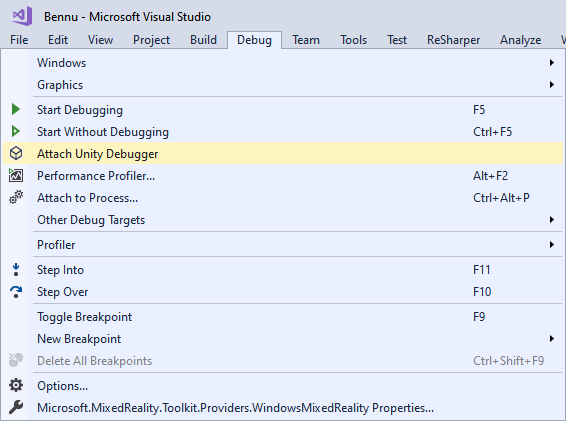 In stead, what you need to do is go to the Debug menu of the main Visual Studio Window and select "Attach Unity Debugger"
Leave this alone. Don't close it, don't press CTRL-C. The debugger is back in da house. No test project this time, as this is not about code but mere configuration. I will start blogging MRTK2 tidbits soon, though. And last but certainly not least, my longtime good Microsoft friend from Italy Matteo Pagani who pointed me to this post by one Mark Plogas that showed me the final crucial missing piece about the Unity debugger entry in the Debug menu . Back in November I wrote about a POC I wrote to recognize and label objects in 3D space, and used a Custom Vision Object Recognition project for that. Back then, as I wrote in my previous post, you could only use this kind of projects by uploading the images you needed to the model in the cloud. 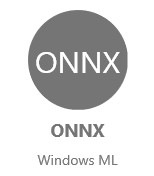 In the mean time, Custom Vision Object Recognition models can be downloaded in various formats - and one of them in ONNX, which can be used in Windows ML. And thus, it can be used to run on a HoloLens to do AI-powered object recognition. Which is exactly what I am going to show you. 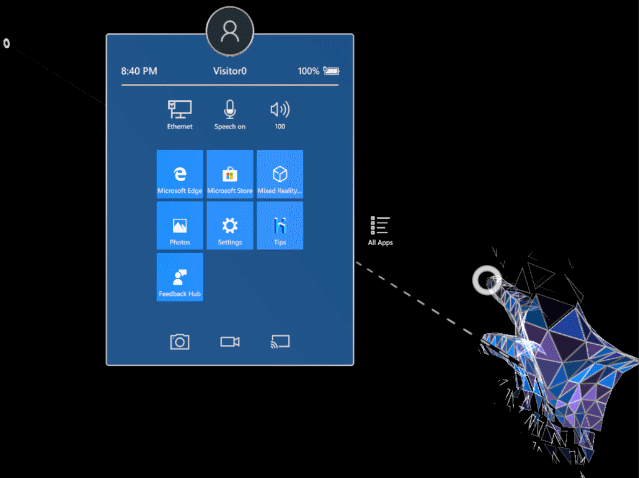 In essence, the app still does the same as in November, but now it does not use the cloud anymore - the model is trained and created in the cloud, but can be executed on an edge device (in this case a HoloLens). ObjectLabeler shoots for the spatial map and places labels. As I said - the app is basically still the same as the previous version, only now it uses a local ONNX file. Basically you create a standard empty HoloLens project with the MRTK and configure it as you always do. Be sure to enable Camera capabilities, of course. 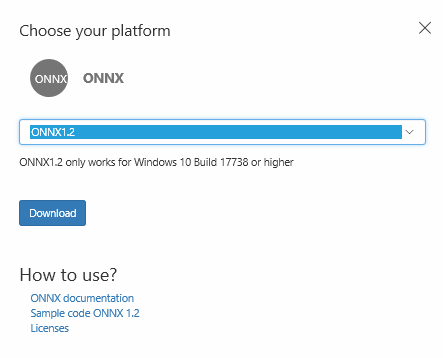 Then you simply download the ONNX file from you model. The procedure is described in my previous post. 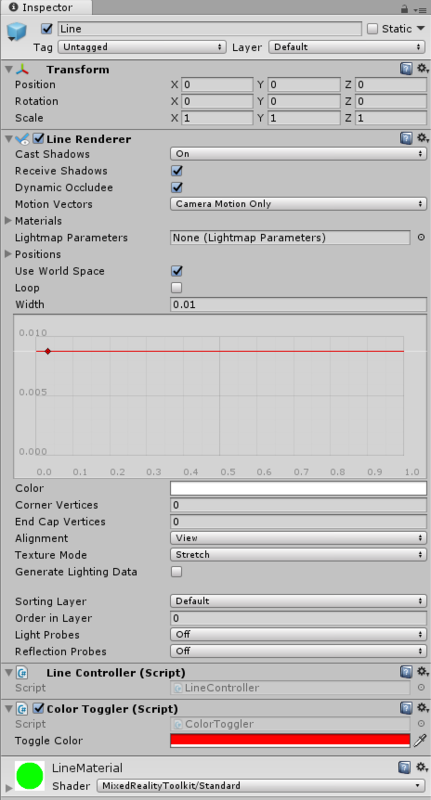 Then you need to place the model file (model.onnx) into a folder "StreamingResources" in the Unity project. This procedure is described in more detail in this post by Sebastian Bovo of the AppConsult team. He uses a different kind of model, but the workflow is exactly the same. Be sure to adapt the ObjectDetection.cs file as I described in my in my previous post. Like I said, the difference between this project and the online version are for the most part inconsequential. Functionally only one thing changed: in stead the app showing the picture that it took prior to starting the (online) model, it now sounds a click sound when you air tap to start the recognition process, and sounds either a pringg sound or a buzz sound, indicating the recognition process respectively succeeded (i.e. found at least toy aircraft) or failed (i.e. did not find an toy aircraft). In all classes I have adapted the namespace from "CustomVison" *cough* to "CustomVision" (sorry, typo ;) ). Notice, here, too the liberal use of preprocessor directives, just like in my previous post. In the start of it's method we create a model from the ONNX file that's in StreamingAssets, using the method I added to ObjectDetection. Since we can't make the start method awaitable, the ContinueWith needs to finish the initalization. As you can see, the arrival of a PhotoCapture message from the CameraCapture behavior fires off RecognizeObjects, just like in the previous app. This method basically is 70% converting the raw bits of the image to something the ObjectDetection class's PredictImageAsync can handle. 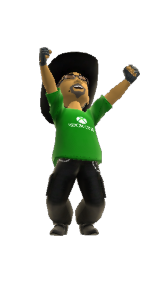 I have very much to thank this post in the Unity forums and this post on the MSDN blog site by my friend Matteo Pagani to piece this together. This is because I am a stubborn idiot - I want to take a picture in stead of using a frame of the video recorder, but then you have to convert the photo to a video frame. 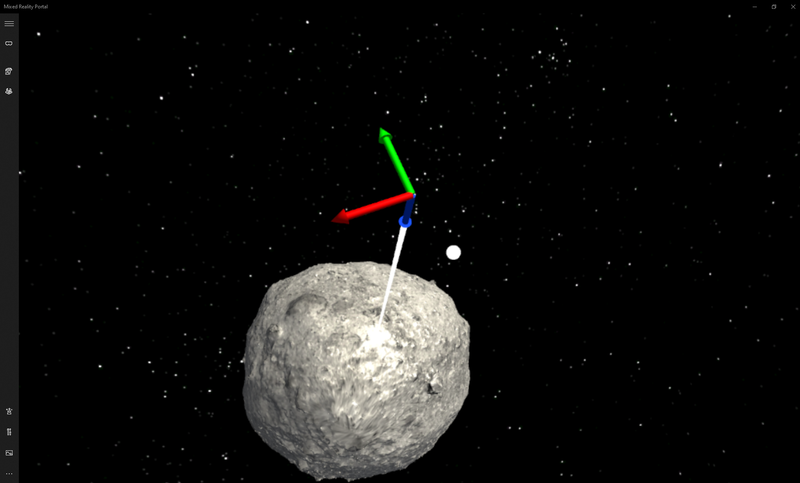 Everything with a probability lower than 70% is culled, and the rest is being send along to the messenger, where the ObjectLabeler picks it up again and starts shooting for the Spatial Map in the center of all rectangles in the predications to find out where the actual object may be in space. Yet - the hit rate is notably lower - the cloud model is definitely more 'intelligent'. I suppose improvements to Windows ML will fix that in the near future. Also, the AI coprocessor the next release of HoloLens will undoubtedly contribute to both speed and accuracy. With 74 pictures of a few model airplanes, almost all on the same background, my model is not nearly enough equipped to recognize random planes in random environments. This highlights a bit the crux of machine learning - you will need data, data more data and even more than that. This method of training models in the cloud and executing them locally provides exiting new - an very usable - features for Mixed Reality devices. 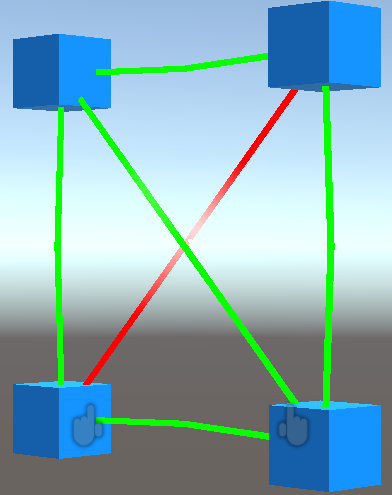 Using Windows ML in edge devices is not hard, and on a HoloLens is only marginally harder because you have to circumvent an few differences between full UWP and Unity, and be aware of differences between C# 4.0 and C# 7.0. This can easily be addressed, as I showed before. The complete project can be found here (branch WinML) - since in now operates without a cloud model it is actually runnable by everyone. I wonder if you can actually get it to recognize model planes you may have around. I've got it to recognize model planes up to about 1.5 meters. Yay! 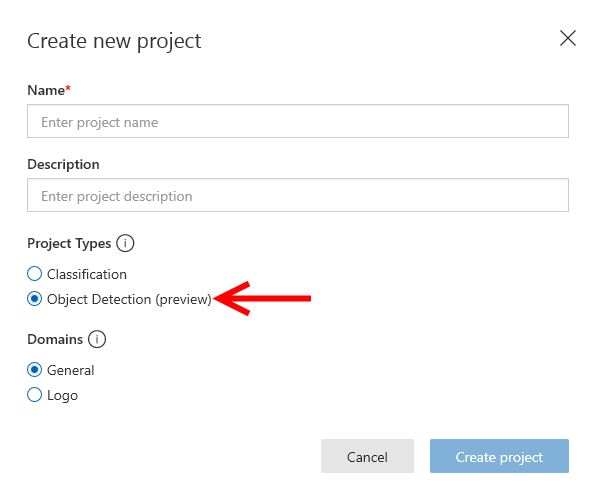 Custom Vision Object Detection now support downloadable models that can be use in Windows ML. We are only going to need the model.onnx file (in the next blog post). For now I want to concentrate on the file that is inside the CSharp folder - ObjectDetection.cs. That file is very fine for using in a regular UWP app. 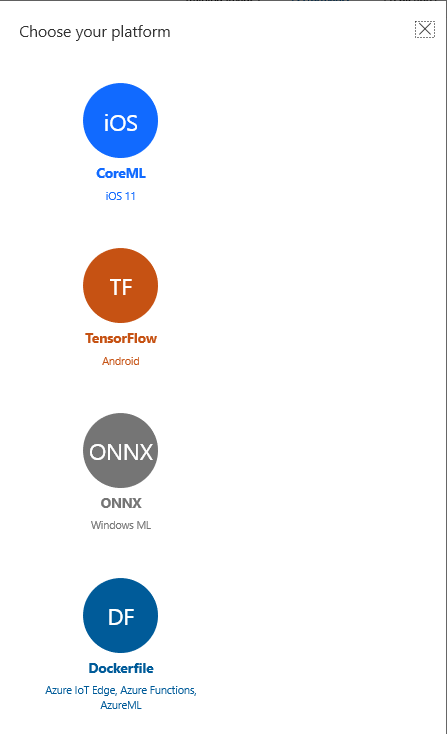 However, although they are running on top of UWP, HoloLens apps are all but regular UWP apps. I will address all three things. You can do this the rough way - by basically putting the whole file in these directives - or only put the minimum stuff in directives. I usually opt for the second way. So we need to put the following parts between these preprocessor directives. Oops. Well I already warned you about this. So we need to refactor this to C# 4 style code. Fortunately, this is not quite rocket science. and then, dear reader, Unity will finally build the deployment UWP solution. But there is still more to do. And then your app will still be running when there's no predictions. With these adaptions you have a C# file that will allow you to use Windows ML from both Unity and regular UWP apps. In a following blog post I will actually show a refactored version of the Toy Aircraft Finder to show how things work IRL. There is no real demo project this time (yet) but if you want to download the finished file already, you can do so here. If you add this behavior on for instance a simple Cube, the color will flick from whatever the original color was (in my case blue) to red and back when you tap it. But add this behavior to a line and and attempt to tap it - and nothing will happen. So what's a line, then? So... how do we add a collider, then? That is not very hard. 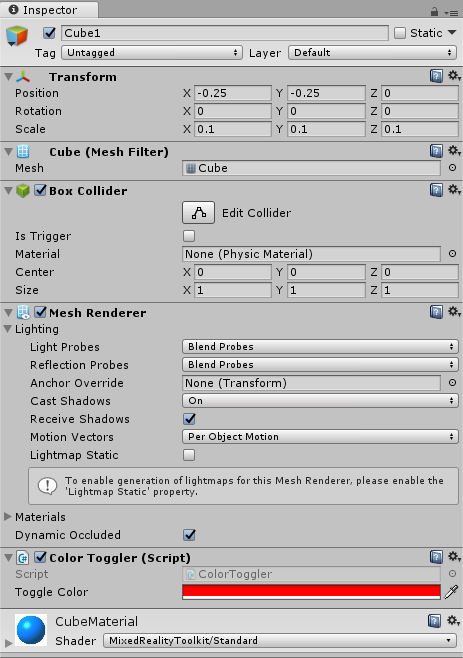 Find the prefab "Line", and add a "Line Collider Drawer" component. This is sitting in "HoloToolkitExtensions/Utilities/Scripts. And hey presto - the line is not only selectable, but even the MRKT Standard Shader Hover Light option, that I selected in creating the line material, actually works. This is partially inspired by this post in the Unity forums, and partially by this one. Although I think they are both not entirely correct, it certainly put me on the right track. 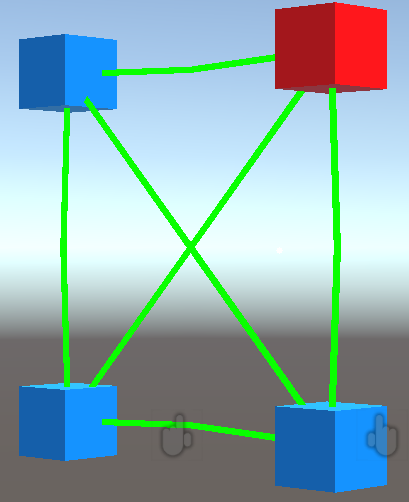 Basically it creates an empty game object, and add a capsule collider to that. The collider is set to the end with of the line, which is assumed to be of constant width. It's midpoint is set exactly halfway the line (segment) and then rotated to look at the end point. Oddly enough, it's then at 90 degrees with the actual line segment, so the collider is rotated 90 degrees over it's X axis. Finally, it is stretched to cover the whole line segment. This basically first removes any existing colliders, then adds colliders to the line for every segment - basically a line of n points gets n-1 colliders. And that's basically it. Now lines can be selected as well. Thanks to both Unity forum posters who gave me two half-way parts that allowed me to combine this into one working solution. 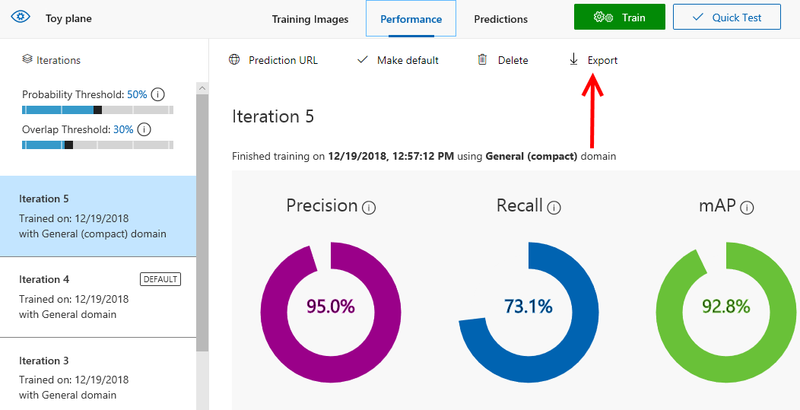 Last month I wrote about integrating Azure Custom Vision Object Recognition with HoloLens to recognize to label objects in 3D space. I wrote the prediction went pretty well, although I used only 35 pictures. I also wrote the process of taking, uploading and labeling pictures is quite tedious. It turns out Custom Vision retained all the pictures I uploaded in the cause of testing. 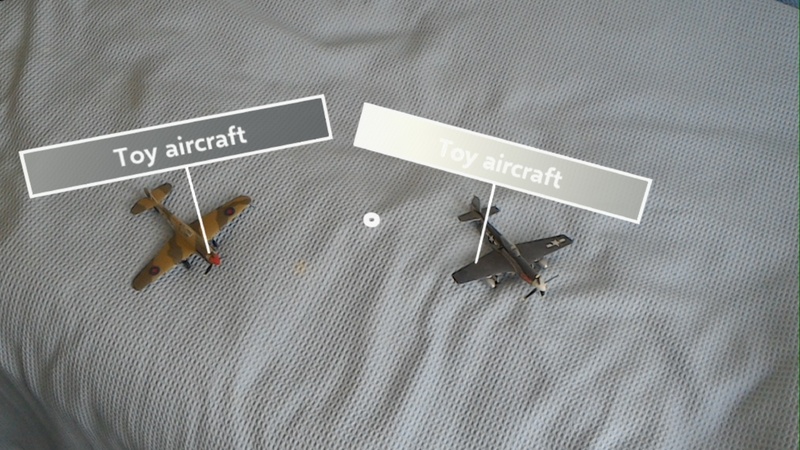 So every time I used my HoloLens and asked Custom Vision to locate toy aircraft, it stored that in the cloud with it's prediction. And the fun thing is, you can use those pictures to actually improve your model again. The model has already annotated the areas where it thinks is a an airplane in red. Interestingly now the model is a lot better than it originally was (when it only featured my pre-loaded images) as it now recognizes the DC-3 Dakota on top - that it has never seen before - as an airplane! And even the X-15 (the black thing on the left ) is recognized. Although the X-15 had a few entries in the training images it barely looks like an airplane (for all intents and purpose it was more a spaceship with wings to facilitate a landing). Yes... the model is quite confident airplane in the picture but it's not very good at pinpointing it. And as far as the Curtiss P40 'Kittyhawk' goes - even though it has been featured extensively in both the original training pictures and the ones I added from the Predictions, this no is success either. The model is better at pinpointing the aircraft, but considerably less sure it is an aircraft. And the outer box, that includes the chair, gives a 30.5%. So in looks that to make this model even more reliable I still need more pictures but then on other background, more different lighting, etc. No (new) code this time, as the code from last time is unchanged. Disclaimer - I have no idea how much prediction pictures are stored and for how long - I can imagine not indefinitely, and not an unlimited amount. But I can't attach numbers to that. the method GetTestData is the method we want to use. If the UI is read-only, there’s no active custom profile. Check if there’s a profile in MixedRealityToolkit-Generated/CustomProfiles and drag that on top of the ActiveProfile field of the MixedRealityTool object. If there’s no custom profile at all, Please refer to my previous blog post. Scroll all the way down to Additional Service Providers. MixedRealityToolkit-Generated/CustomProfiles and shows this editor. 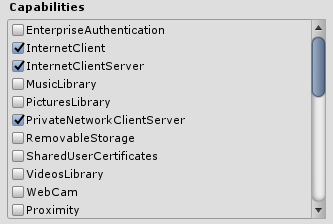 If you click the “Component Type” drop down you should be able to select “Assets.Apps.Scripts” and then “TestDataService”. MRTK-vNext provides a very neat visual select mechanism for wiring up dependency injection that is very easy to use. I can also easily retrieve implementations of the service using an interface, just like any other IoC platform. The usage of profiles makes it very flexible and reusable. This alone makes it a great framework, and then I have not even looked into the cross-platform stuff. That I will do soon. Stay tuned. In the mean time, the demo project can be found here.